To the editor: does ownership matter? Canadian Hemp Corp. Processors, Contractors, Manufacturers of Hemp. Health Canada has made some changes to the list of approved cultivars. As with last year there are 23 varieties are available for cultivation. "FIN 314" is now registered under the name "Finola"
Two varieties have been withdrawn: Fedora 19 and Futura. Fedora 19 has tested greater than the 0.3% limit for multiple years. An official monitoring test gave a 0.71% THC result. Futura has also tested higher than the limit over multiple years. Seed, grain and stalks from these varieties produced in 2000 or before, may still be processed. Two varieties are "now under observation": Finola (formerly FIN 314) and Uniko B. Finola had two samples that tested over 0.3%, with readings of 0.32% and 0.39%. Both fields were located in Quebec. According to Gen-X Research, Canadian marketers of the variety, both fields were unduely stressed out due to weed competition. Uniko B had sample tests with results of 0.34% THC in 2000. The Hungarian variety was also singled out in 2000. Both varieties are still available for cultivation this year, and will be re-evaluated over the next year. Crop sampling and testing is required by law: All growers of Industrial Hemp must have their crop sampled by an authorized Crop Sampler. The sample must then be tested by a competent laboratory. Test results must be reported to the Office of Controlled Substances, Industrial Hemp Program, 123 Slater Street, A.L. 3502A, Ottawa, Ontario, K1A 1B9. The Office of Controlled Substances must be also informed in the event of crop failure preventing samples being drawn for testing. USO 14 has fewer off types; good oil profile; large seed good for dehulling. Good oilseed variety; mid-height; bred for dual use production. Strong oilseed profile with highest GLA on average; early variety; shortest hemp. Anka is the newcomer: mid height; strong oilseed profile according to research. Any holder of an industrial hemp license is required to submit GPS coordinates of the hemp field to Health Canada. While satisfying Health Canada's criteria is not too difficult, many potential hemp growers prefer to leave the GPS/mapping requirements to professionals. In many cases, farmers would rather worry about farming than about possible consequences of an inaccurate or improperly prepared map. For an informative hemp specific GPS web site, check out http://www.prairie.mb.ca/hemp.htm. In response to requests by producers and would be producers for up-to-date prices, Hemp Report asked around the industry for the going rate of hemp grain. Prices are CND unless indicated otherwise. Note that these prices are from early March, and at point of reading, may be historical. "Right now I don't know if there is a price per tonne. The last quote that I had put to me by some large European buyers was $450 US/T delivered to Europe. After costs the farmer would receive $.17 or $ .18 cents per pound CND funds. " Darryl notes that this price was turned down. "Conventional FIN-314: 30 - 40 cents/ lb. (bulk) = 660.-880./MT, depending on quality. Can get birdseed quality/other varieties for less. Organic Finola: 75-90 cents/lb. 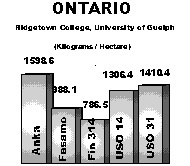 = 1650-1980/MT"
"Average prices are 40 cents/lb. for regular grain and approx. 60 cents/lb. for certified organic. Perhaps a bit higher for the organic. " " It looks to me like '99 conventional grain is $0.20/lb, 2000 is up to $0.50. Organic grain is around $0.80/lb. (The yields are way less.)" Meanwhile, sources in Manitoba say that Parkland and Kenex have agreed to maintain a price of US$0.45 a pound for a truck load of birdseed, (22 MT) palletised and wrapped. For a pallet, prices are US$0.50 a lb. per pallet, FOB Winnipeg. Note: US$450/Ton seems to be the ballpark price for world/Chinese originating hemp grain prices. Anka is the new Canadian cultivar developed by IHSDC. 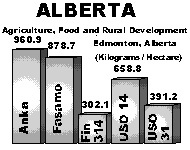 According to 2000 research results from Alberta, Manitoba and Ontario, it has good potential as a high yielder. Our goal at A.O.S. is the improvement of natural soil fertility and increased production in both quality and quantity. Inclusive in that goal is the reduction of the reliance on toxic synthetic chemicals used in present crop production. Our philosophy is to develop products that work with nature and use the forces of nature to accomplish our goals. Interlake/Agassiz basin very wet, many crops turned over, suffer from poor drainage on heavy clay soils. "Finola best yield 1980 lbs./acre dried, average over 250 acres 1325 lbs./acre"
"Conventional Finola yields in 2000 averaged just over 900 lbs./acre "
A great deal of attention should be paid to the nutrient requirements of hemp crops, not only for a productive yield, but for the long term health of the soil. According to McPartland's definitive Hemp Pests and Diseases "Cannabis places greater nutrient demands upon the soil than other crops." Fibre crops require high N, high K, as well as Ca, P, Mg and micronutrients. Seed crops, compared to fibre crops, extract less K and more P from the soil:. Ph of the soil also has an effect on the availability of nutrients in the soil. A soil Ph of 6.5 is generally recommended as best. 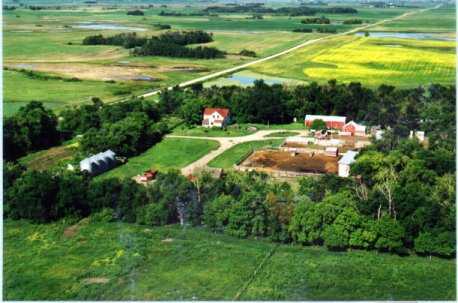 1999 N. trials conducted by Manitoba Agriculture's Bruce Brolley looked at five different rates of Nitrogen Application. "Hemp yield responded to increasing amounts of nitrogen. The response curve did not plateau at 150 lbs/ac, indicating hemp may respond to higher rates nitrogen. The 50 lbs/ac rate showed a yield higher than the 75 but equal to the 100 lb rate. The increase of 43 lbs between the 75 and 50 lbs/ac of N is not significant." 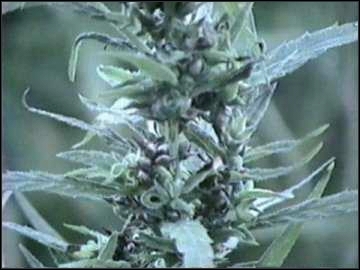 Increased rates of N also increased the height of hemp plants. A parallel sulfur study observed "Hemp yield may increase with the addition of sulfur on sulfur deficient soils. This is (based on) one trial at one location and further work is required, particularly at low sulfur sites." Another single trial determined that Hemp showed a yield response to increasing rates of phosphate fertilizer. A lack of Nitrogen: chlorosis, yellowing of leaves; excess N will cause lush dark green growth and may be more susceptible to disease; reduced tensile strength of fibre; roots may rot. A lack of sulphur is critical, as sulphur is needed for "enthusiastic microbial activity" (Bart Hall, Bluestem Associates); as well, S , along with N, has a significant influence on protein quality. With its high nutrient uptake, hemp could be classified as a soil destroyer, were it not for its deep root system and the practice of leaving stems, brachts, leaves and flowers in the field. Crop residue will give much of the nutrients back to the earth only if this mass is incorporated into the soil. Leaving this mass exposed on the surface, will cause oxidization of the nutrients. Whether you are a conventional NPKS farmer or an organically inclined one, organic matter in your soil is key. Organic matter or humus is the feedstock for the microorganisms that make nutrients available to the plant. Without this microactivity the nutrients from crop residue will never become available in the soil. Prairie hemp producers should take special care managing their crop, as long term soil loss is an ongoing concern in the Prairies. As a result of a century of intensive cultivation, over half of the OM in some fields have been lost in 100 years. You may be using less fertilizer than you think: as a general warning, Sask Ag and Food (SAF) informs producers that between 20-60% of their N application and 10-30% of the P application are never used by the crop. Part of the reason is related to mechanical issues and timing of the application: other reasons can squarely be placed on the lack of activity of beneficial organisms in the soil. This year, Gilchrist Farms will be growing and selling bio-organic hemp. Soil stimulated, chemically-free production. Naturally Saskatchewan. Our on-farm research in BOMA techniques is helping to grow higher quality food and better nutrition. Contact: Doug Gilchrist, Gilchirst farms, Box 22045, Regina, Saskatchewan, S4S 7G7, Canada. The Organic Food council of Manitoba has formed an Organic Farming Mentorship Program. According to the Council, there are an increasing number of people who want to get into organic farming and are looking for ways to gain knowledge and practical skills to make this possible. This program will link these people with the organic food producers who are willing to pass on some of their skills, knowledge and experiences. The basic concept of the Mentorship Program is to enable people to work on organic farms of their choice for a summer season while formulating a plan for their future. The program also involves visiting other organic farms and attending field tours along with researching ongoing field trials at the University of Manitoba. During the following winter the participants would take formal courses and attend workshops, conferences, etc. in an effort to gather more information pertinent to their future. We were quickly corrected by able readers. The following two studies soon appeared in our in box and we learned that: THC distribution in the seed is more problematic than commonly thought and while dehulling may not remove all the THC, it certain does enable a good part of it to be removed. As well, there are different cleaning methods which will remove much of the THC. All this being said, absolute zero may never be met, but for regulatory purposes, we are already there. Most hemp products now being produced in Canada will meet the 1 ppm or under threshold these products are being tested for. Thanks to Hemp Oil Canada for making these studies available for publication in this journal. Project Purpose: The theory was that hempseeds do not contain THC, but rather that the seed coats are contaminated by the leaf matter surrounding the seed bud. However, this had never been scientifically proven in a laboratory setting. Our project purpose was to determine if hempseeds do intrinsically contain THC by analyzing the whole seed, seed hulls, "nut" membrane and "hemp nut". This analysis would be conducted on the seed components derived from actual hemp food processes (seed cleaning and dehulling) and by carefully dissecting whole hempseeds in a laboratory environment. Triplicate subsamples would be analysed in duplicate for the six hempseed varieties being tested in this research project. The results of this analysis will ultimately provide the answer as to whether THC-Free status can be realistically be attained by commercial processes. Conclusion: It would appear from the results that achieving a "THC Free" status is not achievable in terms of a true zero. However, in terms of a relative zero, properly prepared whole hemp seeds can be cleaned and mechanically processed in such a way that the levels of THC are reduced to below 1.0 mg/g and in a number of cases to below 0.5 mg/g. Health Canada has regulated and limited the content of THC in hempseed derivatives to 10 mg/g (10 parts per million). You can download the whole Lab Analysis study in MS Word or Adobe Acrobat format. Project Purpose and Objective: The theory is that Hempseeds do not contain THC, but rather that the seed coats are contaminated by the leaf matter surrounding the seed bud. Our project purpose was to develop processes that would allow us to eliminate and/or reduce the levels of THC presently found in hemp food products and develop a process to sterilize the whole seeds and render them non-viable. Development of various processes would be the key to moving hemp food products from "niche" markets into the main stream for use by value added manufacturers and food processing companies looking to boost the nutritional content of their products. Conclusions: The results of pre-washing the whole seeds in the various solutions proved that the levels of Delta9-THC contaminating the seed coats could indeed be significantly reduced from 20% up to 88%. The most interesting observation is that a simple pre-wash of the seeds in water only was also relatively as effective as any of the other solutions tested. The use of water as a pre-wash would obviously be the most economical cleaning agent to utilize. However, the study did not address the advantages of each test solution being utilized also as an agent to rid the seed of any microbial food contaminants. From purely a cost perspective to reduce the levels of Delta9-THC, the use of a food grade detergent or degreaser was most effective. You can download the whole Hemp Food Products & Processes study in MS Word or Adobe Acrobat format. "Operation Ditchweed" Thanks to all Hemp Report readers who have sent leads over the last two on where to find wild hemp. This wild gene pool may be very important for future breeding of far north adaptable varieties. Each wild hemp location is different -- we want them all to learn just how these diverse hemps thrive so well in such adverse conditions. If you know where authentic wild hemp grows, with all discretion please contact our civilian response team to arrange ripe seed collection. Every patch of ditchweed is a winner. And no, we don't sell wild hempseed but yes, we will pay for the real thing. PS: Health Canada reminds us that ditchweed cannabis program is not covered under the Industrial Hemp regulations --- we are seeking where these stands might be arising. Proper permits will be in place in the future for retrieval as advertised.